Reader Leo Glenn sent a photo in which are hidden eight Monarch butterfly caterpillars, which look like the photo below, and three milkweed bugs (two obvious, one hidden), which look like the photo below that. Your job is to find all the insects before I give the reveal later today. Here’s a “Spot the Wildlife” photo for your readers. After many discouraging years of seeing so few Monarch butterflies and caterpillars at our home in rural western Pennsylvania, we seem to be having a resurgence this year. 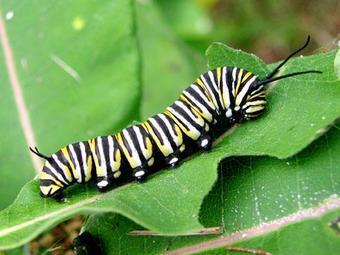 We’ve seen quite a few butterflies, and have counted at least 20 caterpillars on our milkweed plants. So here’s a photo of some of our Butterflyweed plants (Asclepias tuberosa) with Monarch caterpillars (Danaus plexippus). I counted eight caterpillars in the photo. Some are very easy to find, some are of medium difficulty, and a couple are pretty hard, but still clearly distinguishable. I’m sending a high resolution image, as your readers will need to enlarge it to find all of the caterpillars. 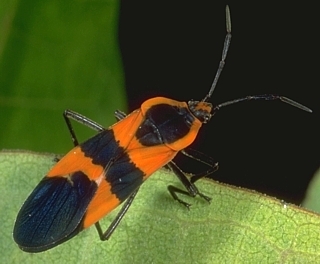 Bonus points if they can find the third Large milkweed bug (Oncopeltus fasciatus). Two are easy to spot, but the third will take some diligence and a sharp pair of eyes. Hint: it is in shadow and only partially visible. I’ll post the reveal at 12:30 pm Chicago time. This entry was written by whyevolutionistrue and posted on July 31, 2018 at 9:10 am and filed under spot the nightjar (and other beasts), spot the ________. Bookmark the permalink. Follow any comments here with the RSS feed for this post. Both comments and trackbacks are currently closed. We had lots of little Monarch caterpillars this year on the milkweed we planted next to our house but they all seem to have been eaten by someone else. Spiders, maybe. Our milkweed look nothing like the ones in this photo. I only see three in this photo. You probably have Common Milkweed (Asclepias syriaca). 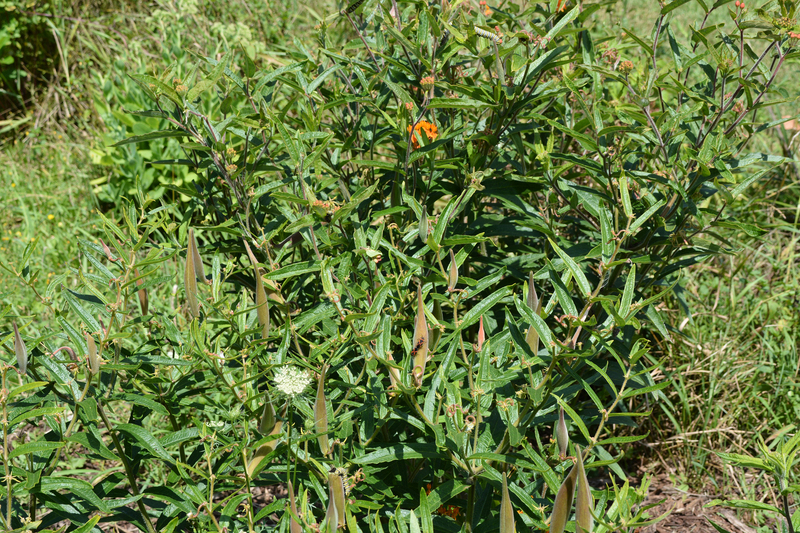 The species in the photo is another species of milkweed called Butterfly weed (Asclepias tuberosa). It’s also sometimes known as Pleurisy Root, as it was once used to treat pleurisy and a variety of other ailments. I can’t vouch for its efficacy as a medicinal, but the Monarchs do seem to like it, and it makes a lovely ornamental in the garden. Yes. Google confirms ours is common milkweed. It isn’t as attractive as the ones in the photo above although the Monarchs seem to like it. It has been a marvelous year for Monarchs in my Florida native plant garden. As many as 30 Monarchs counted in a 5 minute time span. Many caterpillars and massive numbers of milkweed bugs. Audubon has promoted native plant gardening heavily and I heartedly recommend. No. Eight monarch caterpillars and three milkweed bugs, two of which are obvious. I got 6 monarchs and just the 2 obvious milkweed bugs. Not sure if there’s nothing new, but it looks great, I can see (after knowing where they are) the insects of interest. … because I complained about resolution before, so thank you.